Image is everything. Just ask these alumni. The birthday party was typical. There was food, a birthday cake, decorations, music and a piñata. All the normal things that parents ensure are present to guarantee an unforgettable party. Maybelline Mendoza ’07, M.B.A. ’14 and her twin sister were attending the celebration for another set of twin girls. The twins’ family was one of the few they had met since moving to the United States from Lima, Peru, two years earlier. Toward the end of the party the birthday twins opened their gifts. Once all the smaller gifts were revealed, it was time for them to open the two biggest gifts from their parents. Two hot pink Barbie cars were rolled in front of them. They were the cars that Mendoza and her twin sister wanted, but their mother couldn’t afford. Mendoza left the party crying that day. The birthday twins lived a privileged life — a life that Mendoza lived outside of. She had some Coca-Cola at the party that day, which was fitting since the brand has become synonymous with good times and celebrations. Mendoza was an example of what the iconic brand has tried to become over the years — inclusive. Inclusive toward gender, race and economic position. The brand seeks inclusiveness right down to the wide variety of names that are printed on its products’ labels. 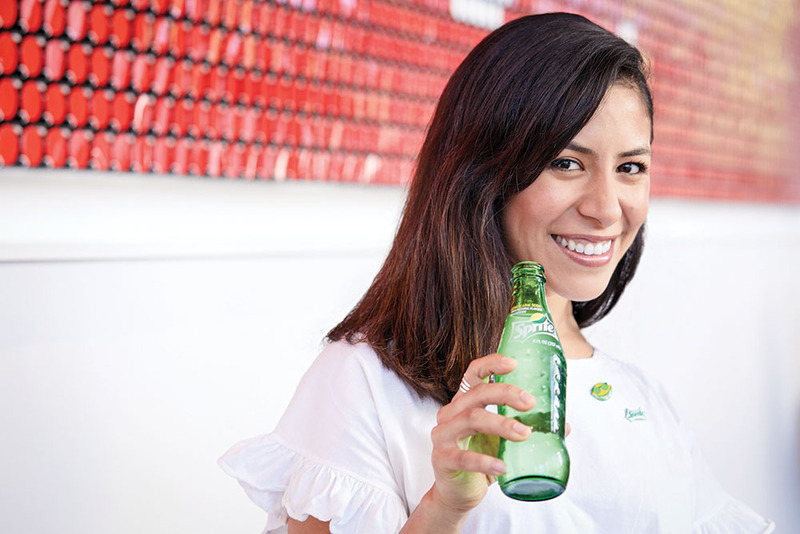 Mendoza is now a brand manager for Sprite, the third largest brand in The Coca-Cola Company’s vast brand portfolio. She is one of three William & Mary alumni who are shaping the company’s image in North America. Tiffany Stone ’91, a sports marketing director for Coca-Cola, is using innovative strategies to create unique initiatives to promote Coca-Cola’s brands with Major League Baseball. Joseph Moan J.D. ’88, chief ethics and compliance officer and associate general counsel for Coca-Cola, oversees and manages all aspects of the company’s ethics and compliance programs globally. Like puzzle pieces sprawled on a coffee table, Mendoza, Moan and Stone fit together, each playing a vital role in ensuring the integrity of the brand and in advancing the legacy of the company. Coca-Cola was founded in 1886 by Atlanta pharmacist Dr. John S. Pemberton. Pemberton wanted to create a distinctive soft drink that could be sold at soda fountains. He created a flavored syrup and took it to his neighborhood pharmacy, where it was mixed with carbonated water and deemed excellent by those who sampled it, according to the Coca-Cola website. Pemberton’s partner and bookkeeper, Frank M. Robinson, is credited with naming the beverage “CocaCola” as well as writing the trademarked handwriting still used on bottle labels and cans today. Coca-Cola ranks fifth on Forbes 2017 list of most valuable brands in the world, behind technology industry giants Apple, Google, Microsoft and Facebook. With a value of $5.4 billion, Coca-Cola is considered the top beverage company in the world. Arm in arm, two polar bears ice skate around a Christmas tree. One glides away and leaps into a toe loop before landing on the ice. Lacking the grace of a figure skater, he loses control and slides back before falling into the snow. Santa Claus appears and hands him a Coca-Cola. The words “Happy holidays, always Coca-Cola,” flash on the TV screen at the end of the 1993 commercial. Rewind to 1971 on a hillside in Italy where young people representing various races sing in perfect harmony clutching glass bottles of Coca-Cola. It was a bold commercial, filmed on the heels of the Civil Rights Movement and in the midst of the Vietnam War. While the United States was divided, the commercial was not aimed at healing America’s social wounds. The brand’s message was much bigger, much more ambitious. It aimed to unite the world. The brand took a stand by supporting diversity and unity in a competitive marketplace where the risk of taking a controversial stand can offend the masses and cost a company millions. THANKS, MEAN JOE: During the 1980 Super Bowl telecast, Coca-Cola featured a memorable commercial titled “Mean Joe Green,” where the NFL player’s seemingly tough exterior is softened by a child who offers him a Coke to drink after the game. In 1980 there was the memorable Coca-Cola commercial titled “Mean Joe Green,” featured during the Super Bowl. In the commercial, Green is limping and holding onto a rail as he heads to the locker room after a football game. A young fan asks Green if he needs any help. Green says no. “I just want you to know, I think, I think, you’re the best ever,” the boy says. “Yea, sure,” Green replies, turning to walk away. “Want my Coke? It’s OK, you can have it,” the boy says lifting his Coke toward Green. Green says no, but the boy insists. “Really, you can have it,” he says. “OK,” Green says with a huff before taking the Coke and drinking the entire bottle in one gulp. Green thanks the boy for the Coke and throws him his football jersey. “Wow. Thanks Mean Joe,” the boy says. The commercial ends with a smiling Green and the words, “Have a Coke and a smile. Coke adds life,” across the screen. Sometimes it’s not commercials that motivate consumers to support a product. Sometimes it can be a marketing campaign that makes them feel a part of something personal. 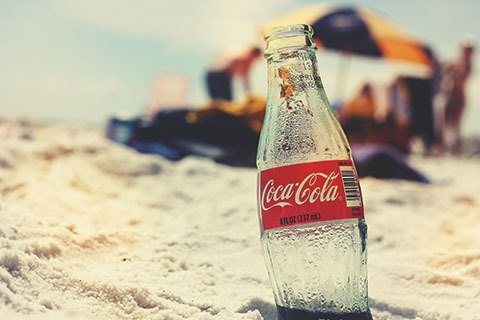 This summer, Coca-Cola brought back one of its most successful campaigns in history — Share a Coke — where the brand prints names on Coca-Cola, Diet Coke, Coke Zero Sugar — and new this year — Coca-Cola Life and Cherry Coke bottles. They added last names for the first time this summer, in addition to the more than 1,000 first names that were available. If your name is not available as a jingle, a song plays that tells you to try next year. A Coke bottle appears with the word “sorry” in place of your name. Coca-Cola bottle on sandy beach. Stone, who has worked at Coca-Cola for 20 years, has held many roles at the company in the areas of customer marketing, entertainment marketing, commercial leadership and brand management. She recently began a new role as director of sports marketing. Stone works with brand teams to create Coca-Cola experiences and marketing initiatives with local Major League Baseball teams and at Major League Baseball events like the All-Star game or the World Series, for example. “Our new partnership with Major League Baseball is based on social and digital marketing and leveraging a significant sponsorship in a very different way than we’ve done with other leagues in the past,” Stone says. Stone says she is coming full circle professionally, considering she started her sports marketing career with the Milwaukee Brewers Baseball Club in 1992. Stone helped launch Coca-Cola Football Town USA in 2002. 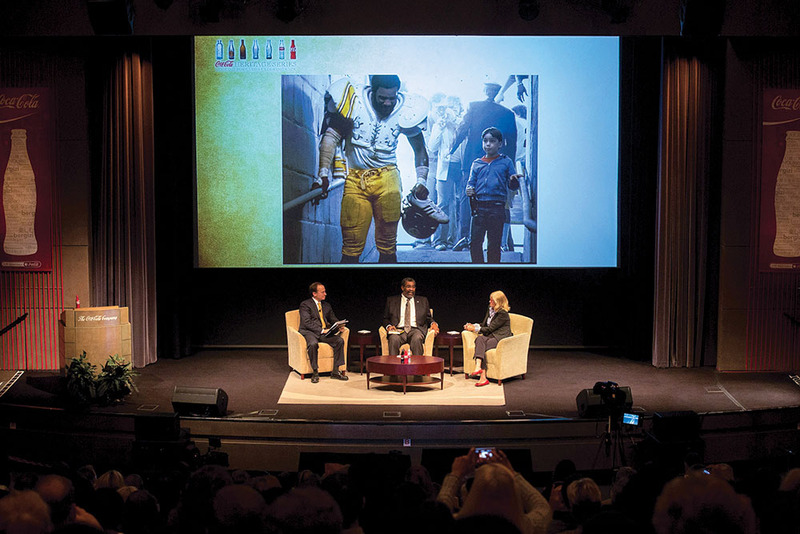 During this time, Coca-Cola reshaped its approach to football as a marketing asset. Instead of creating brand campaigns and events that revolved around the NFL shield or the Super Bowl, the company shifted its focus to locally relevant football teams. The move came after research showed that fans connected more closely to their hometown team at a variety of levels beyond just the NFL. Stone says she admired the iconic brand from afar years before ever stepping into the Atlanta headquarters. Stone decided to pursue a career in marketing because she wanted to use her creativity and penchant for connecting the dots to solve business problems. Her interest in marketing and her passion for athletics were two things she wanted to capitalize on to build a career. It was her academic and athletic experiences at William & Mary that helped her do that. Stone grew up in Milwaukee and played basketball and tennis in middle school and high school. She attended William & Mary on a four-year athletic scholarship. Stone excelled in the classroom as well as on the basketball court. At William & Mary she held the record for career leader in rebounds for many years, with over 1,000 rebounds and 1,000 points scored. One of those experiences was a home game against George Mason University. William & Mary was down by four points. After Angie Evans Romano ’91, Tiffany’s roommate and co-captain, made a three-point shot, Stone was fouled at the buzzer. The Tribe was in the bonus so she was headed to the free throw line. She needed to hit both shots to help the team win and avoid overtime. “I remember going to the free throw line and someone had just taught the team that if you are nervous when you go to the free throw line, you should hum your favorite song,” Stone says. Stone takes the first shot. She lands it. The score is tied. Stone spins the ball backward in her hands, bounces it three times as she’s done a thousand times before, and takes the final shot. The result is a repeat of the first. Stone says participation in athletics for women in particular is very important because it teaches women how to compete and how to handle success as well as failure gracefully. What was the last concert you attended? What is your favorite book? These details may seem unrelated to influencing the type of beverage you buy, but they are examples of tools used in the marketing world to better understand consumer wants. The Coca-Cola Company has multiple brands, each with their own identity. Some of their brands include Diet Coke, Dasani, PowerAde, Sprite, Minute Maid and Honest Tea. Reaching consumers in new and fresh ways through innovation is essential for any brand, even one like Coca-Cola that has been around for more than 130 years. The Coca-Cola Company launched Sprite Cherry earlier this year through a platform called Coca-Cola Freestyle, Mendoza says. Freestyle is a soda fountain machine found at different food outlets that has more than 200 beverage flavors that can be mixed together to form new drinks. Mendoza is the oldest of three girls. Her mother brought her and her sisters to the United States from Peru because she wanted them to have a better life. Mendoza says her mother didn’t speak English, but she worked any job she could find to support her family. Her mother’s work ethic rubbed off on her in high school. She not only excelled academically, but also had perfect attendance. Mendoza’s high school perfect attendance came with a $250 stipend for college. It was a stipend she almost didn’t get. For Mendoza, every cent counted. She used the money to help pay for her education at William & Mary, where she became the first in her family to graduate from college. While Mendoza and Stone craft creative and smart marketing to keep the iconic brands at The Coca-Cola Company relevant to consumers outside the walls of the company, Moan uses his legal expertise and that of his team to ensure that all associates worldwide understand their responsibility in acting ethically and in compliance with policies to build trust and maintain the company’s image and reputation. Integrity of the brand is paramount, and an essential ingredient in all things the company does. Moan is part of the team that ensures that integrity is not only associated with Coca-Cola products, but also that thousands of employees are upholding the company’s ethical standards every day. Additionally, he is tasked to ensure the company’s employees understand and adhere to the company’s Code of Business Conduct and all legal and regulatory requirements. Coca-Cola employees are expected to keep ethics and integrity front of mind when they are doing business and when they live their lives. Before entering the business world, Moan, a first-generation American, was headed down a military track. Moan, who grew up in Fort Lee, N.J., attended the Virginia Military Institute in Lexington, Virginia, on a four-year ROTC scholarship. After graduating he served for four years in the United States Army as a field artillery officer and became acquainted with the JAG officers at Fort Carson, Colorado. “Being around the JAG officers was really the first contact I had ever had with lawyers in my life and I saw that their work was both challenging and also very beneficial,” Moan says. He decided to attend William & Mary Law School because he was accustomed to learning in academic environments with smaller classes, referring to his high school and the Virginia Military Institute. Prior to joining Coca-Cola in 2001, Moan worked at Texaco for 13 years as a senior counsel, responsible for global employment, labor litigation and employee benefits law. Do you remember the first time you had a Coca-Cola product? Maybe the first time came and went without you remembering or noticing. Or maybe you remember the first time you felt the bubbles of a freshly poured Coca-Cola tickle your lip. Whether there is a clear memory that comes into focus or not, the influence and messaging of the brand has woven itself into the cultural fabric of the world. For Mendoza, her first time was at a birthday party that was just as bitter as it was sweet. Stone has always associated Coca-Cola with celebrations. For her, celebrations meant getting a Coca-Cola in an icy glass bottle to share with family and friends. Moan vividly recalls his first time enjoying a Coca-Cola. He was eating out with his family at McDonald’s. While Mendoza, Moan and Stone have different roles at Coca-Cola, they all shape the brand in some way.